Home | Blog | Crowdsourcing 101: How To Gather Consumer Data and Feedback and Still Be Their Friend. Crowdsourcing 101: How To Gather Consumer Data and Feedback and Still Be Their Friend. Sam Walton of Sam’s Club and Wal-Mart is noted for saying to his executives “If you need any question answered, go to a store and ask our customers.” The idea of crowdsourcing is quite similar; bringing your clients, experts and fans of your company into the fold to assist your company in creating something palatable for your target audience. Many companies have used this method to gather ideas for their marketing and branding campaigns for a few years now. Doritos has become notorious for their crowdsourcing techniques to create their Super Bowl commercials. Recently, Harley Davidson has shifted almost their entire marketing campaign to their fans who they now rely upon to create the ideas behind their marketing campaigns. At the heart of crowdsourcing lies inclusion. Find your core audience of those willing to take a look at your problem, this could be anyone from the ambassadors of your product to experts in the field of whatever problem you need solving. To find these people, harness your social media platforms, particularly the ones where people are talking the most about what you would like crowdsourced. Another option is to look toward crowdsourcing websites like www.crowdsourcing.org, which can provide resources and forums to get your project off the ground. Another tactic to find qualified members for your crowdsourcing project would be through your LinkedIn network and the forums that lie therein. The LinkedIn forums provide a trove of focused specialists eager to help answer questions and possibly even join in on your project if they feel a passion towards it (or find it a good resume booster). 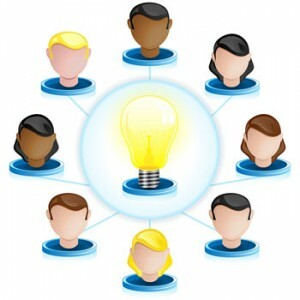 The website Open Innovators has compiled a great list of crowdsourcing sites that will help you find your desired team. Crowdsourcing is all about sharing your project with a community, leave few secrets between you and your team. Start by creating a project brief and identifying your primary audience. Then, list your goals and desired outcomes succinctly enough that every member of your group understands your project in the same light you intended. Set parameters and guidelines for your project along with a deadline. Remember, you are the coach of your crowdsource project, so make your management available for questions and to provide feedback on your project. Make sure to stay in contact and stay on the pulse of your project. Having a transparent and straightforward attitude with your crowdsource will create a better, more actualized product. There is an inherent reward of completion built into crowdsourcing, particularly if your project was crowdsourced by those who are fans and advocate your product. It is always nice however to sweeten the pot with other incentives. Websites like www.innocentive.com offer cash rewards for those who can help companies solve their problems. Incentives do not have to be in just cash form (although in many cases, it can be the biggest motivator); it can be in product samples, discounts, swag, and about anything that is worth the work put in. Remember that most people work for an incentive, so the sweeter the reward, the better work you are likely to get. Don’t forget to show your appreciation to those who helped you finish your project either, give them credit and laud them when and where it is due. Once your project is completed, make sure you tell the world that your project was crowdsourced. Not only is it great PR for your company, but it is also a great way to gather more people to crowdsource your next project. If your target audience is within your crowdsource, you may consider allowing them to choose a winning campaign/project by a vote while in the research phase. Gather feedback about the project from your audience and make sure to send it back to your crowdsource so they know what went right and what they could do better on their next project. Following through in this way will keep your crowdsource pool active and happy to work with you again. Have you ever used crowdsourcing before? How did it work for you? Let’s talk about it! We would love to hear your feedback. Comment below or send me an email at: daniel@mediacontour.com. Daniel Clauser is the Social Media Strategist for Media Contour (https://mediacontour.com). Daniel is eager to connect with all and answer any questions and may be reached @mediacontour on Twitter and Facebook or via email at daniel@mediacontour.com. Thank you for the mention and we look forward to reading further articles on crowdsourcing. I’m really loving the theme/design of your website. Do you ever run into any web browser compatibility issues? A couple of my blog visitors have complained about my website not operating correctly in Explorer but looks great in Firefox. Do you have any advice to help fix this issue? Noah, we have a great resource for multi-browser testing (http://crossbrowsertesting.com/). Unfortunately, it’s not cheap, but it’s an indispensable tool for testing. It even includes mobile devices which are aplenty and ever changing. Let me know if that helps. Best of luck!